Making phones for the elderly is one thing, but making a smartphone that’s approachable and still powerful is another. Doro have got a pretty respectable history of making phones for seniors and this, their new Liberto 820, adds the power with the support and encouragement that customers may need. Not only that, but it’s a nice slim design too, so you’re not going to feel out of place using one. Before we get to the full specs we should mention that the handset has a real-time backup system, so users can rest easy knowing that everything is stored safely. There’s 500MB of online storage to facilitate this and the phone itself has large, clear icons to make navigating it easier. Not only that, but Doro have kept the physical buttons for Home, Back and the menu / options function plus there’s a smart help system too. A step-by-step tutorial gets you up to speed, and there’s remote programming plus an ICE system (In Case of Emergency) too. The 4.5″ screen has a resolution of 940×560, which is perfectly fine for the big display text. It matches a lot of normal smartphones in the other specs too, running Android 4.4.2 with WiFi, GPS, Bluetooth 4.0, 8 megapixel auto-focus camera, microSD card (up to 32GB) and a 1900 mAh battery. There’s recommended apps on the phone, but you also get the full Google Play store too. A coaching feature is embedded into all the core applications so that learning to use the phone is a seamless journey rather than an imposing challenge. Plus, if you intend on buying this for an elderly relative, there’s remote device management tools (“My Doro Manager”) to help others configure, manage and offer remote manage the phone. If your Aunt calls you with a problem, just remotely connect to the phone and remotely adjust the volume level or screen brightness etc. Further details are available below, or you can head to Doro.co.uk. The company tells us that the handset will be available in the Autumn. We’ll keep you posted. 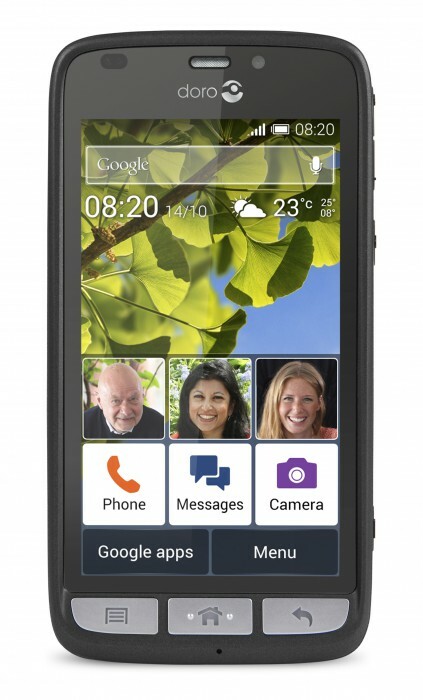 They’ve already started advertising it, as you can see below..
London, 05 September 2014: Doro, the global leader in mobile devices for the growing population of seniors has further expanded its portfolio with the addition of the Doro Liberto® 820 smartphone. This handset is designed for seniors who want to enjoy the benefits of a smartphone – but may need some additional support, patience or encouragement on their journey of discovery. Created with an intuitive coaching feature embedded into all core applications the device allows the user to learn more as they journey into a world of apps. It empowers them to build their confidence and become more engaged at their own pace. This is achieved by providing helpful advice, easy set-up assistance and suggestions of more things to experience. The Doro Liberto® 820 comes with a suite of remote device management tools called My Doro Manager. These are geared towards seamlessly delivering an easier set up, fuss-free configuration and ongoing management of the device. My Doro Manager consists of two elements: a tutorial application within the device and a unique third-party ‘Helper’ app. Helpers are designated family members or friends who will be able to offer remote assistance to the user once invited. Help will come in the form of configuring certain settings such as volume level and screen brightness. Furthermore, nominated Helpers are able to recommend certain apps to the user and offer support in learning how to use them. The device’s status and usage patterns can also be used to determine if the user needs a little more support with certain tasks or functions. The Doro Liberto® 820 is fully Google certified meaning the user can access over 1.2 million apps from Google Play, opening up an exciting world of digital fun. Doro has also included a selection of recommended apps, which can be easily chosen via the management suite to help users enjoy their phones more from the beginning. 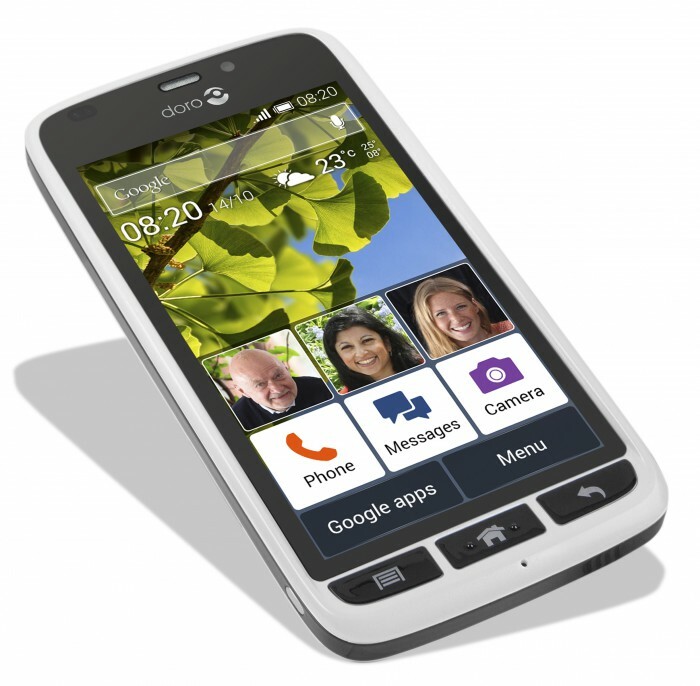 Doro’s ergonomic slim design of this phone takes the user’s changing needs and preferences fully into account. It is the first smart device to integrate an assistance button on the underside – a design feature first introduced by Doro into its feature phones and part of its core DNA. The company’s recent user studies show that seniors desire this feature on smart devices too. This, along with ICE contacts and the My Doro Manager tool bring a whole new level of reassurance and security for the user. Physical operation keys provide better feedback for easier, direct access to: switching the device on/off, taking a photo, adjusting the volume, navigating the menu system, returning to the home screen and back function. Backlit, high-contrast keys make operation visually clearer and easier. The device offers an ultra simple mode and options for very large text. The phone comes with a raised frame around the screen to protect the glass when positioned face down – making it more scratchproof and durable than others. The rear of the device has soft-touch coating for easier and more comfortable handling. Additional important design elements include a large and bright touchscreen, 8MP video camera, GPS, Bluetooth connectivity, simplified menus, HD voice and hearing aid compatibility.